Hybrid transparent electrodes with silver nanowires (AgNWs) and single-walled carbon nanotubes (SWCNTs) were fabricated on plastic films by a low-temperature solution process. The hybrid transparent electrodes exhibited a sheet resistance of 29.2 Ω/sq with a transparency of 80% when 6 wt.% of SWCNTs was mixed with AgNWs. This sheet resistance was less than one-fourth that of the AgNW transparent electrodes that were prepared using the same method. This reduction in sheet resistance is because the SWCNTs formed bridges between the AgNWs, thus, resulting in high conductivity of the hybrid transparent electrodes. The hybrid electrodes formed on plastic films exhibited high conductivity as well as excellent stability in sheet resistance when tested using a repeated bending test. Flexible transparent electrodes are critical components of flexible electronic devices such as touch screens, organic solar cells, and organic light-emitting diodes (OLEDs). Considerable efforts have been made to develop flexible transparent electrodes [1, 2], for example, carbon nanomaterials such as single-walled carbon nanotubes (SWCNTs) [3–10] and graphenes [11–14] and random networks of silver nanowires (AgNWs) [15–27]. Compared with rare and expensive indium tin oxide (ITO) films, SWCNT and graphene transparent electrodes may have significantly lower costs owing to the abundant availability of source materials and coating processes. However, the sheet resistances of SWCNT and graphene transparent electrodes are 100 to 500 Ω/sq with a transparency of 80% to 95% [1, 2, 6, 14]. This value is too high for use with organic solar cells and OLEDs, which require sheet resistances of approximately 10 to 50 Ω/sq . Thus, a substantial improvement in the sheet resistance of SWCNT and graphene electrodes is a necessity. Among these materials, AgNW transparent electrodes exhibit excellent electrical conductivity because silver has the lowest resistivity (as low as 1.59 × 10−6 Ω·cm) among metals as well as good stability and high corrosion stability [15–27]. Moreover, because the AgNW electrodes can be coated by cost-effective and scalable roll-to-roll manufacturing, a variety of electrical devices deposited on AgNW electrodes have been reported including touch screens , organic solar cells [16, 19–21, 25, 27], and OLEDs [22, 23]. Although AgNW electrodes have several excellent features, there is a problem that inhibits their fabrication on heat-sensitive substrates: a heat treatment at approximately 200°C is usually required to achieve high electrical conductivity. The heat treatment fuses the AgNWs such that tight connections are created between them leading to high conductivity [18, 25]. However, AgNW electrodes cannot be fabricated on heat-sensitive substrates because heat-sensitive plastic films are easily deformed by heat treatments at such high temperatures (approximately 200°C). Specifically, plastic films are deformed by heat because they undergo tension in roll-to-roll processes, when the process temperature is higher than the glass transition point of the plastic films. Therefore, processing at lower temperature is desirable for roll-to-roll processes, and room temperature processing is ideal. The key requirement for fabricating AgNW transparent electrodes with low sheet resistance is that the AgNWs should be electrically connected. Certain techniques for the low-temperature processing of AgNW electrodes have been proposed [17, 25–27]. In our previous study, AgNW electrodes on plastic films were dipped into water and ethanol to eliminate insulating polyvinylpyrrolidone (PVP) and then mechanically pressed to connect the junctions between the AgNWs at room temperature . The conductivity of the AgNW transparent electrodes did not increase by simply eliminating the PVP because in this case there contacts between AgNWs were still too weak. The rinsed AgNW transparent electrodes were mechanically pressed to achieve high conductivity at room temperature by connecting the AgNWs. Unfortunately, the use of mechanical pressing is limited in certain cases. For example, mechanical pressing cannot be applied to brittle layers or substrates. Garnett et al. have connected junctions of AgNWs on plastic films by a light-induced plasmonic nanowelding technique . The nanoscale gap between two crossed AgNWs enables effective light concentration and heating at the point where the wires are to be joined together. Zhu et al. have fabricated hybrid transparent electrodes with AgNWs and titanium dioxide (TiO2) on plastic films at a low temperature of 80°C . Tighter contacts between AgNWs were achieved by volume reduction of the TiO2 solution and the capillary force induced by solvent evaporation, which largely improved the conductivity. Although hybrid transparent electrodes of AgNWs and other materials are very useful, only few additional attempts toward their preparation have been reported. To achieve low sheet resistance at low temperatures, the authors have attempted to incorporate other conductive materials into AgNWs to create conductive bridges between them. Coated AgNW electrodes exhibit high sheet resistance because there are weak contacts, and small spaces exist between the AgNWs [25, 27]. Conductive nanomaterials which form conductive bridges between the AgNWs are expected to enhance the conductivity of AgNW transparent electrodes. The added materials should have high conductivity, high transparency, a suitable shape for creating bridges between the AgNWs, and compatibility with respect to solution processing. Recently, it was reported that CNTs acted as conductive bridges in hybrid transparent electrodes of graphenes, and they enhance the electric conductivity of the electrodes [28–31]. CNTs have high conductivity [32–34] and high transparency owing to their nanoscale diameter. Moreover, only a single coating is required when using a suspension of mixed AgNWs and CNTs because CNTs can be uniformly dispersed into ethanol which is the solvent used in our AgNW suspension. For these reasons, CNTs were selected as the additional material for preparing the hybrid transparent electrodes by a coating method. In this study, the authors have fabricated transparent electrodes at a low temperature by adding SWCNTs to AgNWs. The hybrid transparent electrodes on plastic films exhibited low sheet resistance, high transparency, and excellent flexibility. These studies on hybrid transparent electrodes demonstrate the potential for the fabrication of electrical devices on plastic films by continuous roll-to-roll processes using a simple, inexpensive, and scalable process. AgNWs with an average diameter of approximately 70 nm and length of 5 to 20 μm were synthesized by the reduction of silver nitrate in the presence of PVP in ethylene glycol . Sixteen grams of FeCl3 solution (6 × 10−4 mol/L in ethylene glycol), 1.08 g of silver nitrate, and 0.98 g of PVP (average molecular weight of 360 k in terms of monomeric units) were added to 125 g of ethylene glycol. After the mixture was heated at 150°C for 1.5 h, 30 mL of the resulting suspension was filtered out through a cellulose acetate membrane filter (Y100A047A, Toyo Roshi Kaisha, Ltd., Tokyo, Japan). The filtered AgNWs were then dispersed in ethanol. The concentration of the AgNWs was approximately 4.0 mg/mL. The SWCNTs had a diameter of approximately 1.4 nm and length of 1 to 5 μm. 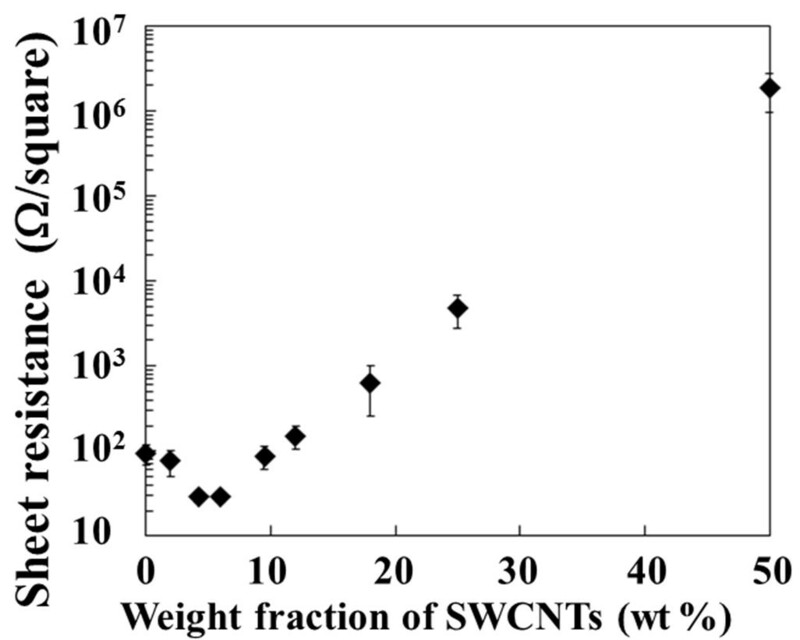 An SWCNT suspension in ethanol (SWNT SO, Meijo Nano Carbon Co. Ltd., Aichi, Japan) was diluted to approximately 0.7 mg/mL. The SWCNT and AgNW suspensions were simply mixed to form hybrid suspension. By varying mixture ratios of AgNW and SWCNT suspensions, hybrid suspensions with different weight percentage were formed. Then, hybrid electrodes were fabricated using these hybrid suspensions. The weight fraction of the SWCNTs varied from 0% to 100%. Fabrication of hybrid transparent electrodes with AgNWs and SWCNTs. The hybrid suspension was drop-coated onto glass or polyethyleneterephthalate (PET) substrates, and the resulting electrodes were heated at 60°C for 3 min to prevent peel off during the subsequent rinsing process. The heated hybrid electrodes were dipped into a mixed solution of water/ethanol (1:1 w/w) for 3 min and then into ethanol for 10 s. Finally, the hybrid electrodes were heated at 60°C for 20 min. Transparent electrodes only with transparency of 80.0% ± 1.0% were selected to compare the sheet resistance. The hybrid electrodes were fabricated with a weight percentage of SWCNTs ranging from 0 to 100 wt.%. AgNW and SWCNT electrodes and hybrid electrodes with 6 wt.% of SWCNTs with a transparency over 80% were fabricated using diluted suspension. Optical transparency at the wavelength of 550 nm was measured using a UV/visible/near-infrared spectrophotometer (V670, JASCO Corp., Tokyo, Japan) with a glass or PET substrate as a reference. The hybrid electrodes on the substrates were observed using a field-emission scanning electron microscope (FE-SEM) (JSM-6700F, JEOL Ltd., Tokyo, Japan) at an accelerating voltage of 5.0 kV and a working distance of 7 to 8 mm. The sheet resistances of the electrodes in a 20 × 20 mm2 were measured using the four-probe method (LorestaGP T610, Mitsubishi Chemical Analytech Co. Ltd., Mie, Japan). The hybrid electrodes on PET films were repeatedly bended by placing them on the convex side of a cylinder with a curvature radius of 5 mm. After the bending test, the sheet resistances were measured again. 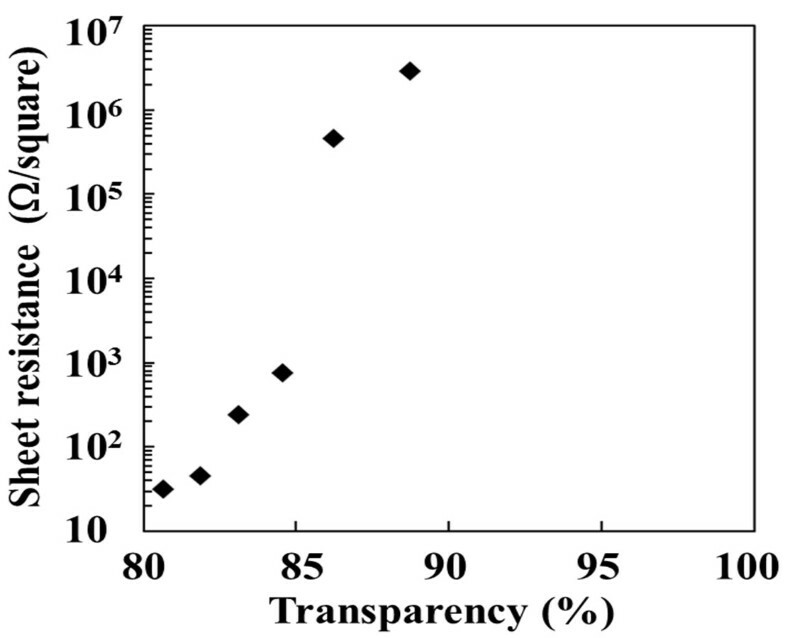 Data for the AgNW and SWCNT transparent electrodes on glass substrates having transparencies ranging from 80% to 100% with varied sheet resistances are shown in Figure 1. The AgNW electrodes exhibited a sheet resistance of 132 Ω/sq with a transparency of 80%. This sheet resistance was more than ten times higher than that of the AgNW electrodes heated at 200°C for 20 min (9.2 Ω/sq). This high sheet resistance resulted from weak connections between the AgNWs. The sheet resistances drastically increased with increasing transparency and exceeded the measurable region (107 Ω/sq) when the transparency surpassed 90%. On the other hand, the SWCNT transparent electrodes exhibited a high sheet resistance of 1.6 × 106 Ω/sq with a transparency of 80%. The SWCNTs used in the present study consisted of two-third semiconducting and one-third metallic nanotubes. 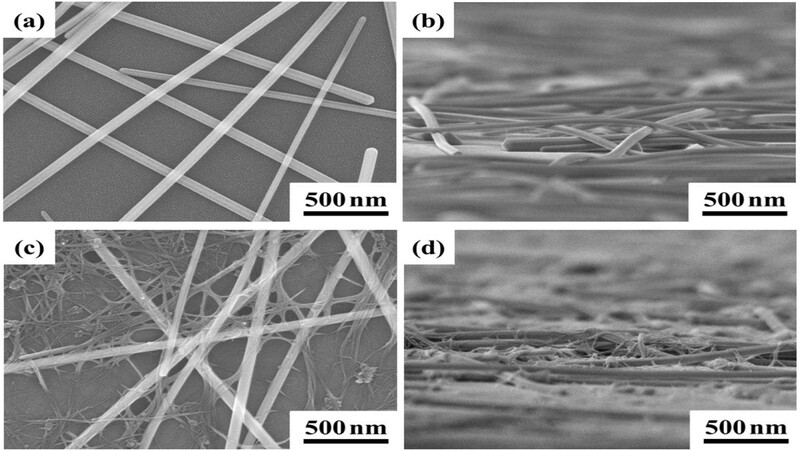 The SWCNT electrodes exhibited a high sheet resistance owing to the semiconducting nanotubes and high contact resistance [4, 6, 8]. The sheet resistance gradually increased with increasing transparency and exceeded the measurable region when the transparency exceeded 93%. Sheet resistances of the AgNW and SWCNT electrodes as a function of transparency. These electrodes were fabricated by low-temperature processing at 60°C. To fabricate hybrid electrodes of AgNWs and SWCNTs, SWCNT and AgNW suspensions were mixed, and the resulting suspension was drop-coated onto glass substrates. Figure 2 shows the sheet resistances of the hybrid electrodes with different SWCNT weight fractions. The AgNW transparent electrodes exhibited a sheet resistance of 132 Ω/sq. The sheet resistance gradually decreased as the weight fraction of the SWCNTs increased from 0 to 6 wt.%. The hybrid electrodes with 6 wt.% of SWCNTs exhibited the lowest sheet resistance (28.9 Ω/sq). This sheet resistance was less than one-fourth that of the AgNW electrodes (132 Ω/sq). Compared with the sheet resistance of the AgNW electrodes heated at 200°C for 20 min (9.2 Ω/sq), it is still somewhat high. However, this sheet resistance of the transparent electrodes was low enough for applications to touch screens, organic solar cells, and OLEDs . For transparent electrodes with over 6 wt.% of SWCNTs, the sheet resistances drastically increased. The increase in the sheet resistance resulted from a decrease in the density of the AgNWs, which played a key role in the conductivity. Hybrid electrodes with 50 wt.% of SWCNTs gave high sheet resistance (1.1 × 106 Ω/sq) and were almost completely dominated by the SWCNTs, as can be seen by a comparison with the SWCNT transparent electrodes, which had a sheet resistance of 1.6 × 106 Ω/sq. Figure 3 shows the sheet resistances of the hybrid electrodes with 6 wt.% of SWCNTs as a function of transparency. The sheet resistances increased with increasing transparency. The hybrid electrodes exhibited a low sheet resistance (less than 50 Ω/sq) with a transparency of 80% to 82%. Then, sheet resistance of hybrid transparent electrodes drastically increased with a transparency over 82%. Sheet resistances of the hybrid electrodes with 0 to 50 wt.% of SWCNTs. The transparency of the hybrid electrodes is constant (80%). Hybrid electrodes were fabricated by low-temperature processing at 60°C. Sheet resistances of hybrid electrodes with 6 wt.% of SWCNTs as a function of transparency. These electrodes were fabricated by low-temperature processing at 60°C. To investigate the phenomenon regarding the enhancement of the electrical conductivity of the hybrid electrodes by SWCNTs, the hybrid electrodes with 6 wt.% of SWCNTs and AgNW electrodes on glass substrates were observed by FE-SEM (Figure 4). For the AgNW electrodes, the AgNWs formed random networks (Figure 4a). Figure 4b shows an off-angle view of the AgNW electrodes. It can be seen that the AgNWs are stacked together loosely with spaces between them, and thus, they make weak connections between AgNWs. This observation explains why the sheet resistance of the AgNW electrodes heated at 60°C (132 Ω/sq) was much higher than that of the AgNW electrodes heated at 200°C (9.2 Ω/sq). The hybrid electrodes also formed random networks of AgNWs and bundles of SWCNTs with a diameter of several tens of nanometers entangled with AgNWs (Figure 4c,d). The off-angle view of the hybrid electrodes clearly shows that the bundles of SWCNTs formed bridges between the AgNWs and filled in the surrounding spaces (Figure 4d). These results suggest that the SWCNTs play a conductive bridging role in connecting the AgNWs. There is considerable validity in this explanation because individual SWCNTs, particularly metallic nanotubes, have high conductivity [32–35]. Although SWCNTs were incorporated into the hybrid electrodes to a limited extent (just 6 wt.%), large amounts of SWCNTs have been observed in the FE-SEM images (Figure 4c,d). This is because 6 wt.% of SWCNTs corresponds to 32 vol.% of SWCNTs. Therefore, SWCNTs can effectively enhance the conductivity of the hybrid transparent electrodes. The electronic transport mechanism between the AgNWs and SWCNTs remains unclear and requires further studies. FE-SEM images of the AgNW electrodes and hybrid electrodes with 6 wt.% of SWCNTs. These electrodes were fabricated by low-temperature processing at 60°C. (a) Top view of the AgNW electrodes. (b) Off-angle view of the AgNW electrodes. The AgNWs formed random networks and were loosely stacked together with some spaces between them. (c) Top view of the hybrid electrodes. (d) Off-angle view of the hybrid electrodes. The AgNWs formed random networks, and bundles of SWCNTs established bridges between the AgNWs and filled in the intervening spaces. Transparency over a wide wavelength range is one of the important properties of transparent electrodes. The transparency was measured with a UV-vis spectrometer using a blank substrate as a reference. 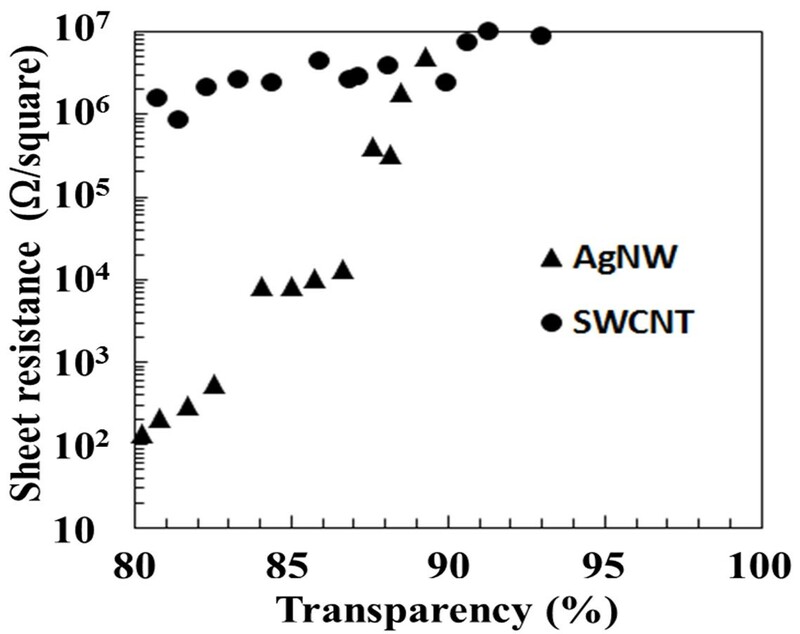 The comparisons of the transparencies of the hybrid, AgNW, and SWCNT electrodes on glass substrates are shown in Figure 5. The sheet resistances of the hybrid electrodes with 6 wt.% of SWCNTs and AgNW and SWCNT electrodes were 28.1, 110, and 2.7 × 106 Ω/sq, respectively. The transparency of the AgNW electrodes remained almost constant from 400 to 1,800 nm. The SWCNT electrodes exhibited excellent transparency in the near-infrared region. The transparency of the hybrid electrodes can be regarded as a combination of the transparency of the AgNW electrodes and that of the SWCNT electrodes. 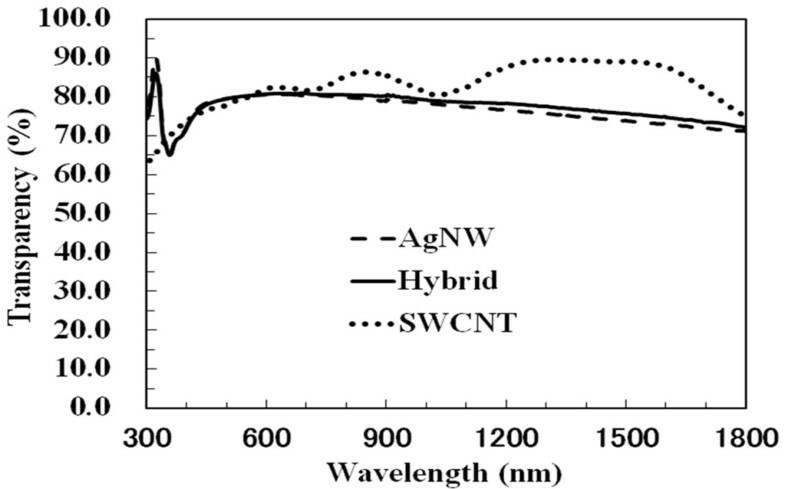 The transparency of the hybrid electrodes was slightly higher than that of the AgNW electrodes in the near-infrared region. The high transparency of the hybrid transparent electrodes over the broad wavelength range (from visible light region to near-infrared region) is a great advantage for solar cell applications. Optical transparencies of the AgNW and SWCNT electrodes, and hybrid electrodes with 6 wt.% of SWCNTs. These electrodes with a transparency of 80% at the wavelength of 550 nm were fabricated by low-temperature processing at 60°C. Hybrid transparent electrodes can be fabricated on heat-sensitive plastic films on a large scale owing to low-temperature solution process. The hybrid electrodes on PET films exhibited high transparency and conductivity that were equivalent to those obtained using a glass substrate (Figure 6a). The flexibility of the hybrid transparent electrodes with 6 wt.% of SWCNTs on PET films was evaluated by the bending test with a curvature radius of 5 mm. Figure 6b shows the evolution of the sheet resistance as a function of the number of cycles of the bending test. The initial sheet resistance of the hybrid electrodes was 29.2 Ω/sq which then decreased to 22.1 Ω/sq after 3 cycles. This decrease in sheet resistance can be attributed to an improvement in electrical contacts resulting from repeated bending treatments. Thus, a few cycles of the bending treatment can be applied to decrease the sheet resistance of the hybrid electrodes. However, additional bending treatment cycles had almost no effect on the sheet resistance on the hybrid electrodes, and the sheet resistance remained nearly constant (only a 5% decrease after 1,000 cycles). Figure 6c shows an off-angle view of the hybrid electrodes with 6 wt.% of SWCNTs on PET films after 1,000 cycles. The hybrid electrodes did not peel from the PET films even after extensive application of the bending test. Therefore, hybrid transparent electrodes on plastic films offer the possibility of roll-to-roll processing for electronic devices including touch screens, organic solar cells, and OLEDs. A photograph, a result of bending test, and a FE-SEM image. Of hybrid transparent electrodes with 6 wt.% of SWCNTs on a PET film. (a) Hybrid transparent electrodes fabricated by low-temperature processing at 60°C on a PET film. The sheet resistance and the transparency at 550 nm were 29.2 Ω/sq and 80%, respectively. (b) Sheet resistance as a function of cycle number. (c) FE-SEM images of the hybrid electrodes after 1,000 cycles. The hybrid electrodes did not peel from the PET films after the bending test. Hybrid transparent electrodes of AgNWs and SWCNTs were fabricated on plastic films by a low-temperature solution process. The hybrid electrodes exhibited a sheet resistance of 29.2 Ω/sq with a transparency of 80%. The SWCNTs formed bridges between the AgNWs and filled in the surrounding spaces, thus, resulting in high conductivity of the hybrid transparent electrodes. Furthermore, the hybrid electrodes on PET films exhibited excellent stability in sheet resistance under repeated application of the bending test with a curvature radius of 5 mm. The current studies on hybrid transparent electrodes demonstrate the potential for the fabrication of electronic devices such as organic solar cells and OLEDs by continuous roll-to-roll processes using a relatively simple, inexpensive, and scalable process. TT is a doctoral student, MN is an associate professor, JJ is a post-doctoral researcher, and KS is a professor at The Institute of Scientific and Industrial Research (ISIR), Osaka University. The authors acknowledge Meijo Nano Carbon Co. Ltd. for providing suspension of single-walled carbon nanotubes. TT is the primary author who conceived this study and carried out the experiments, characterization, and drafting of the manuscript. MN, JJ, and KS revised the manuscript. All the authors discussed the results and contributed to the final version of the manuscript. All authors read and approved the final manuscript.